It's good to be back into "blogland" after making a whole bunch of family memories these past days. Our daughter and Grandsons arrived on the 20th and stayed until the 28th. That is the longest they have ever stayed, so we had lots of time to make memories. Get ready for picture overload! You have been warned! Last weekend one of Bridget's college friends was hosting an Open House for her Tiny House that she and her family had just moved into. 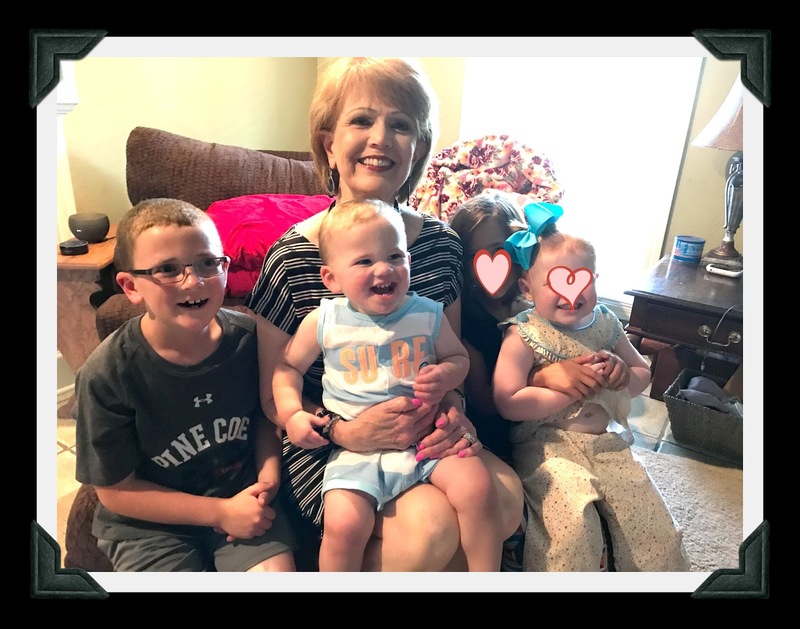 A little history.....Chamie and her husband decided to sell their 2500+ square foot house and build a 360 square foot house for them and their 3 children. AND, that's just what they did. Basically, they have future plans that they want to save big time for and they knew that doing this would cut their housing cost to the bare minimum and give them more to save. Bridget was so excited that the open house was while she was here. So, we all loaded up and off we went. I have always been so intrigued by the tiny house concept and, while it is definitely NOT for me, I have to admire the folks that can do this and say it works for them. I have watched Tiny Houses on HGTV but let me tell you, there's nothing like seeing and touring one in person! And, also, let me tell you everything has a place and everything MUST be in it's place! Chamie has the cutest blog and if you would like to pay her a visit, you will so enjoy it. It's called The Tiny Truth and she blogged about their entire journey to their Tiny House. 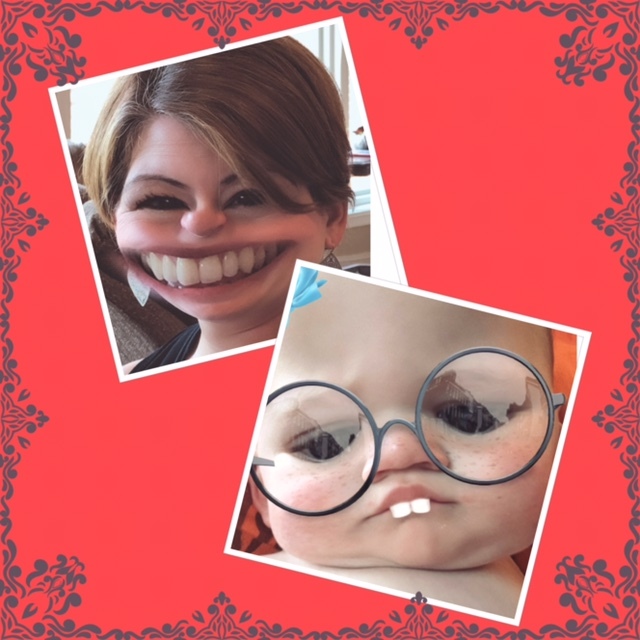 We played with Snap Chat and these were two of the cutest creations I've ever seen done. Coleman's picture could definitely win a contest I do believe! And, we bought and played Speak Out one evening and couldn't play for laughing our fool heads off. If you are looking for a fun game then Speak Out is for you! 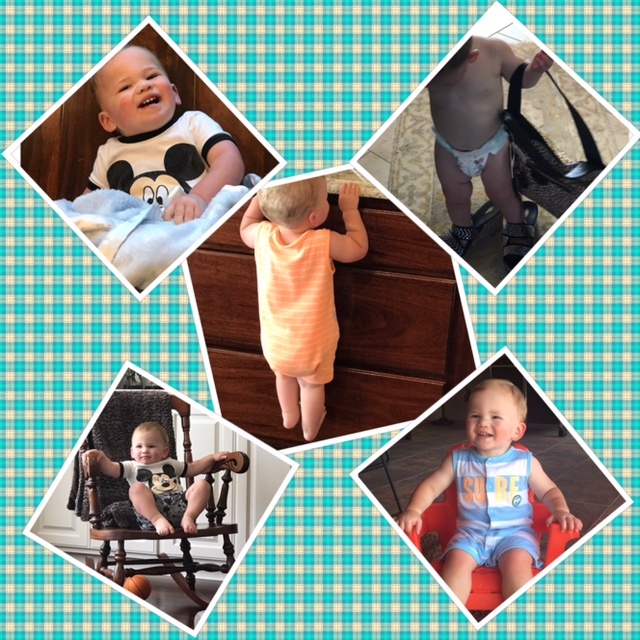 To say that Coleman is a busy boy would be an understatement! He is non-stop unless he is asleep! Our other 3 Grans did not hold a candle to him in their busyness. But, need I say, his cuteness makes it a little more bearable! Pretty much Clancy wanted to fish all the time. But, his Poppa obliged him only in the very early morning or the late, late evenings. 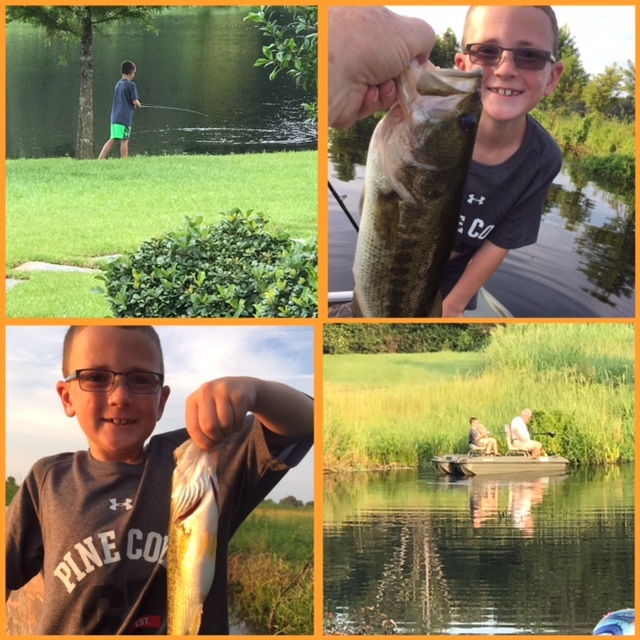 Fishing is not an option in the heat of the day, not even for a spunky 8 year old. There was lots of noise, fun cousin time, karaoke time, piggy back riding and stuff strowed from a to izzard (as my Grandmother use to say). 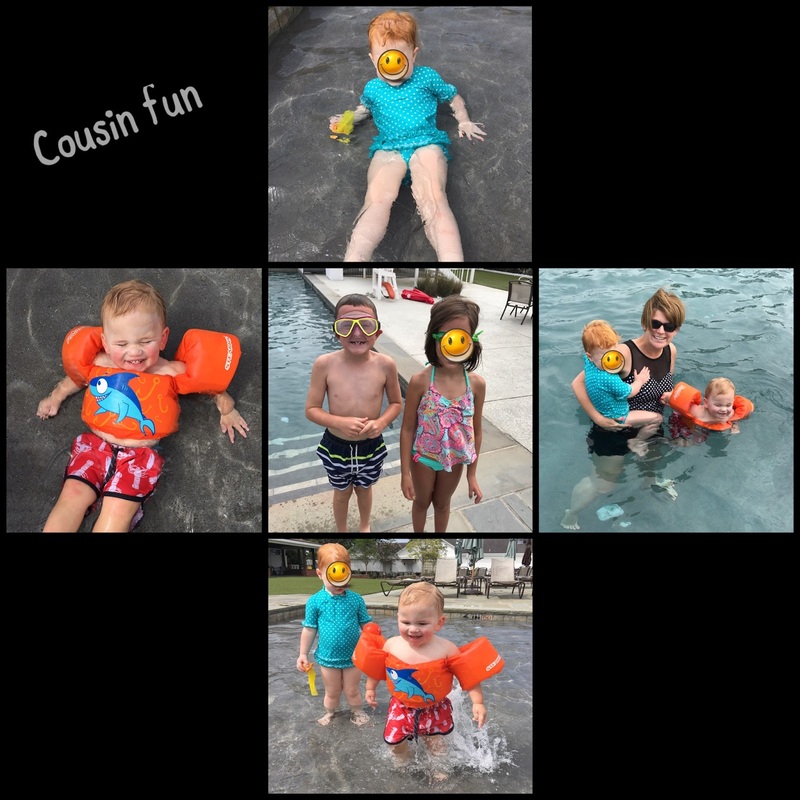 All 4 of the Grans love the water so we spent a fun time at the swimming pool. It wore the little ones out but the big ones stayed on since Poppa was willing to stay with them. We all put on our Sunday best (Coleman did get dressed after this picture) and went to church. While we were in worship service they asked the visitors to fill out a visitors card and Clancy would have nothing but to do just that. I want you to see his card as it brought tears to my eyes. Without any provocation he got to the prayer request part and look at what he put in the blanks (for my CiCi so she won't go blind). Oh, my goodness, could that be any sweeter? Bridget had shared with him about my eye situation and they had been praying that my eyes would heal without any further problems. I'm telling you we should never underestimate the tenderness of a child's heart and the truths that they can grasp! And, the week ended with my "big" birthday. The children and Grans treated me to a celebration a couple of days early so that Bridget and the boys could share in the fun. And, hats off to my daughter and DIL for doing a great job on my birthday gifts. It was indeed a full to over flowing week and it may take me most of this week to recover. I am thankful for all my many blessings these past 65 years. 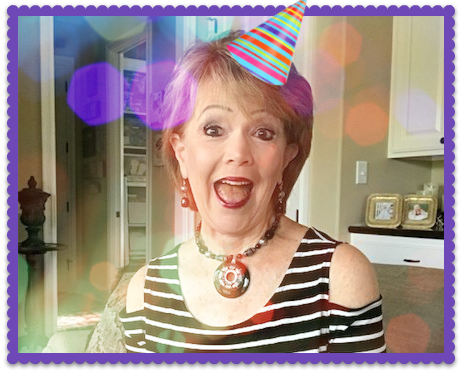 Here's to # 66!!! 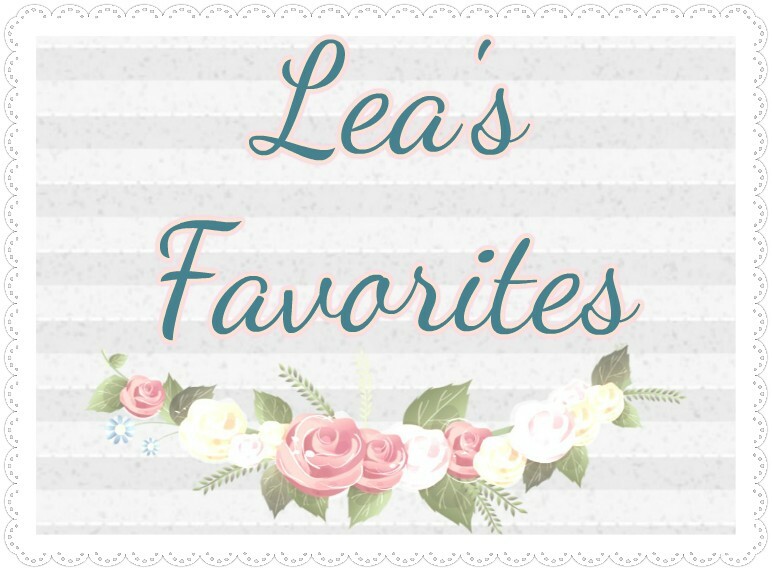 Yes, siree, it's time for some of my favorites and, as I say, perhaps one or more of them will become a favorite of yours as well. These little jewels may have been around for a long, long time but I just saw them a couple of weeks ago. I am always looking for low calorie sweet treats. These have 27 calories each or 5 for 140 calories. I think that's a win win on all accounts and they are delish. Someone asked me why I didn't just eat 1 double stuffed with 140 calories. Well, there's a big difference in 1 or maybe 2 of the thin oreos versus 1 of the overstuffed oreos, like 102 calories. Perhaps most of you reading this have already tried cooking your bacon in the oven. I had not until last week. I had heard from many sources that it is the BEST bacon there is and I will fully agree and the best part, it is MESS FREE!!! I do not fry foods! I cannot stand the mess. So, I just buy the thick sliced precooked bacon and warm it in the microwave. It is certainly not bad, but this thick sliced cooked in the oven will make you "slap your pappy." I lined a large cookie sheet with foil and cooked it at 400 degrees for right at 20 minutes. If you haven't tried this then you need to. I promise it will be your new favorite way to cook bacon. 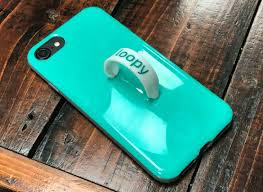 You have likely seen the Loopy Cases for smart phones but have you gotten yourself one yet? If not, you might want to. I debated about it for a while and decided that it would likely be a real help carrying and using my phone. And, I was right!! Mine came last week and I have really enjoyed it. My only problem is that I had a designer case for my phone that I had made off of Etsy and it is sooo much cuter than the loopy case. But, maybe they will come out with a more designer case in the future. Until then, practicality wins out!!! First, I have never felt comfortable posting pictures of me, by myself, on my blog. It just seems a bit presumptuous to me, but I read blogs where the authors do it ALL the time. So, I guess they are comfortable with it and maybe I will get there. Now.............I love this maxi dress that I got at Chicos earlier this summer. It is two of my very favorite colors, black and white. It is sleek fitting, has the cold shouldered sleeves that I love and it HAS sleeves! It's rare to find a summer dress with sleeves and I want sleeves and sometimes I do not want to wear a shrug or jacket over a sleeveless dress. NOTE: Bridget and the boys did arrive safely yesterday afternoon so the fun has started around here. 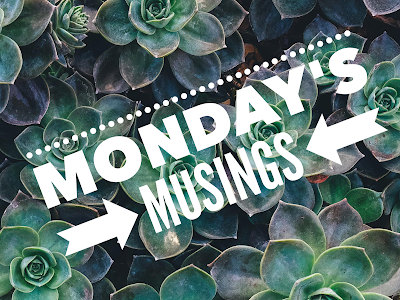 I'll be "hit or miss" here in blogland for the next week or so. But, rest assured, I'll have lots to share once the "dust settles." I'm going to play a little catch up on what's been going on around here the past couple of weeks. 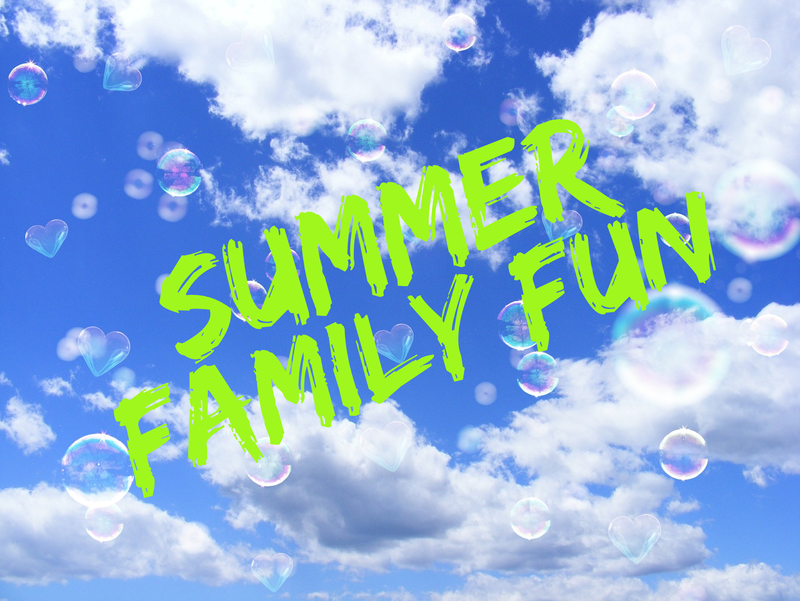 It's been a busy and fun time and we have some more fun and busyness in the days ahead. I hosted our Pokeno group week before last and, as you can see, I went with a "lemon theme." 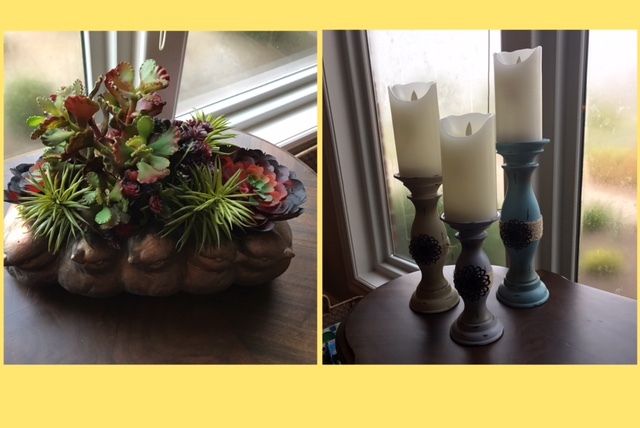 I have used lemon decor as my spring and summer decor and thought it would also make really cute table decor. I found the gorgeous placemats at Tuesday Morning. They are a heavy paper (by Michael Designs) and I got the napkins to match and then I made lemon labels for our water bottles at Avery.com I served a salad dinner with a lemon dessert, it made for the perfect summer meal topped off with a fun game of Pokeno. I have been pondering a new look for our dining room table and I think I found the perfect table arrangement. I saw this container at Pier 1 and most of the floral pieces came from there as well. I took all of it up to one of our local floral designers and she put it all together for me and added the orchids and I could not be more pleased! It makes such a statement!! In front of these windows has sat a wooden toy chest since we moved in this house. I've never really even thought about anything else going there. 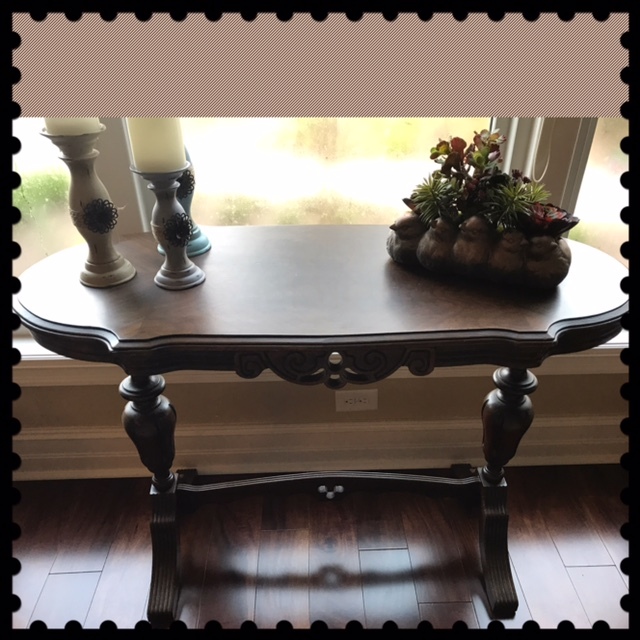 That is until............until I saw this gorgeous mahogany table last weekend. I was in a lovely antique shop that was host to a oriental rug show when it caught my eye. I immediately thought how pretty it would be in this place and it ended up coming home with me. Of course, every decorative table has to have something decorative on top of it. Last Tuesday my sister in law and niece came to visit from DesMoines. They had not been in a while and we so enjoyed their visit. 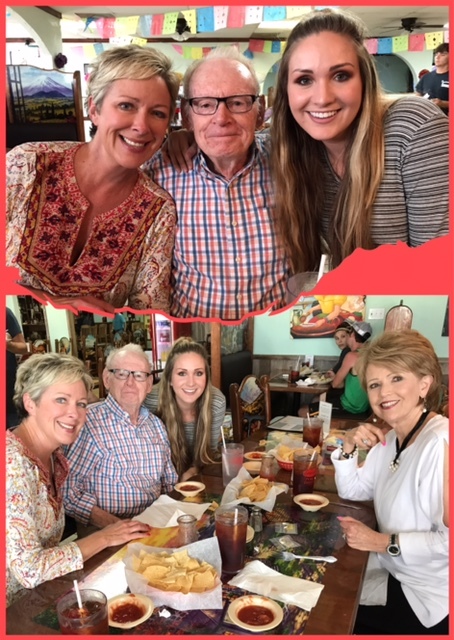 They spent some treasured time visiting with Daddy and then we took him out to eat at one of his favorite Mexican restaurants. We had some special family time and then they left to go and spend some time with Suzy's family in Texas. We'll be enjoying some more special family time when our daughter and our two grandsons arrive later this week. If you are my friend on Facebook then you likely saw that I did get a good report from my Retina Specialist this past Friday. He was pleased with the healing process but I am still restricted until I see him again on Aug. 4th. I really thought he might lift the restrictions if things were going well but he did not. But, that is just fine, I can be inconvenienced for my eye sight any time. I am extremely thankful for the good report and I will continue to play by the rules. And, he did say that I would be seeing him every 3-6 months from here on out. So, I guess that means for the rest of my life. Good grief, I'm hoping that's a very LONG time but I really do not enjoy going to Doctor appointments. Guess I'd better get to enjoying it. 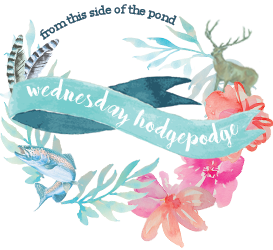 It's question day with Joyce, another way of saying it's the Wednesday Hodgepodge. Well, research informed me that our state, Louisiana, has 6 nicknames. The only two I knew anything about is, Bayou State and Sportman's Paradise. Yes, both of these are most fitting as we have beautiful bayous all over and if you are a man and you live here then chances are really good that you are a hunter and fisherman and you drive a big truck, have a big trailer and own 4-wheelers and the such. I wouldn't change the nicknames if I were in charge, don't think I could come up with anything more fitting. We attended a sort of pot luck on the 4th of July and I took potato salad. AND, I have to confess, I did not make it. The Wal-Mart deli has the best Red Skin Potato Salad around and I didn't see the need in trying to make something that probably would not have been near as good as the bought. I buy it all the time. Their other potato salad, not so much! To remember, "this too shall pass." Those sleepless nights, those colicky afternoons, those days of crawling and getting into everything and on and on it goes. It will pass so much quicker than you can imagine. It's just one phase right after another and they are not all enjoyable but you will live through it and they'll be grown and you will wonder where the years went. #2 - I will be seeing my Retina Specialist this Friday afternoon and I'm so hoping for another good report. And, I would just love it if he said all my restrictions have been lifted and I can bend, lift and exercise. But, hey, I'll be happier than happy if he just says that my eyes are doing well. Added note - July is my birthday month. Yea! me! I will celebrate 65 years on the 29th and I'm more than grateful for everyone of those years. I really think I'm just going to celebrate all month long because I deserve it. I mean 65 years! And, it was made very official yesterday when I received my Medicare card in the mail. 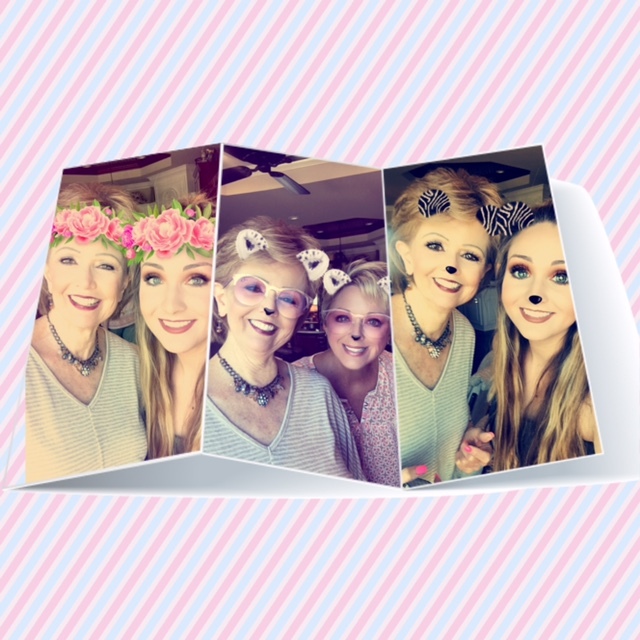 P. S. My sister in law and niece are here visiting for a few days so I will likely be out of blogland until the weekend. See you then! 10 daily habits. Well, since I'm such a creature of habit, I had to link up this month. 1 - My first daily habit is heading straight to the coffee pot once my feet hit the floor, around 5:30AM. I can't imagine imagine starting my day without a cup of coffee. 2 - With coffee in hand I go to spend some time in the Word and in prayer. I struggle at times to make sure that, even though this has been a habit of mine for years and years, that it is more than a habit. I want it to be a special time for me and the Lord to begin my days. 3 - I am then off to shower, do my makeup, grab another cup of java and then make the bed and tidy up our bedroom. 4 - Normally, it is my habit to go and get on the glider for 30 minutes and enjoy a Hallmark movie while doing so. But, right now, while my eyes are healing that isn't allowed, but I'm hopeful after Aug. 5th to be "back at it." 6 - I have a habit of making a list for any errands I need to do each day and shortly after dressing I'm usually off to get started on those. I like to get errands done early in the day. And, 4-5 afternoons a week I go and spend some time with my sweet Daddy. 7- I stop by my desktop computer 2-3 times in the morning and another 2-3 times in the afternoon. Those stops include checking my email, scanning through Facebook and doing any needed Quickbooks work. 8 - I take a sweep by the laundry room to see if there is any that needs to be done. I do not generally do laundry every day. It's just the two of us, so I probably do laundry 3-4 times a week. I'm linking up, for the first time ever, with the Blended Blog Gals and answering their questions for the week. 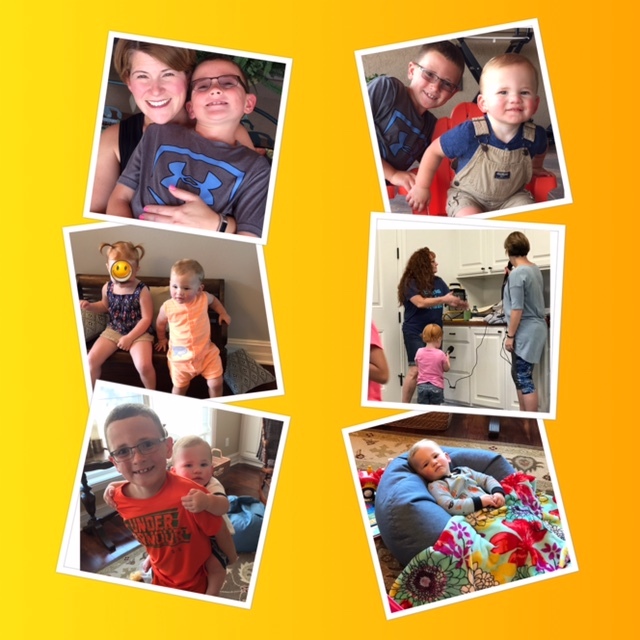 My blogging buddy Laura, over at The Horton Family had participated and I so enjoyed her answers that I decided I would participate as well. It's always fun to know more about each other and this is a great way to do just that. I hope you enjoy! Well, I am not really an animal lover but if I had to say, it would be a Goldendoodle dog. My brother and SIL got one several years ago and he stole my heart the second I met him and that's saying a lot. But, Tater doesn't really know he is a dog, he is so human and I do love him. And, I'm pretty fond of our son's family dog, Bella. Bella is a toy poodle and cute as a button and well behaved. 2 - Wine or beer? 3 - Socks on/off while sleeping? Definitely off! I don't want the warmth or the restriction on my feet. 4 - One piece or two piece swimsuit? Oh, my goodness, it would be a one piece with a skirt. And, it is such a rare, rare occasion for me to be in a swimsuit that I can't even remember the last time I had one on. But, just so you know, the one I have is really quite cute. 5 - Cooking at home or eating out? I'm about equal in my preference on this, I enjoy eating out and we definitely do a fair amount of that but it's nice to eat at home on occasion as well. 6 - Pepsi or Coke? 7. Regular or Electric toothbrush? I have used an electric toothbrush for the past several years and I love them. My teeth feel so much cleaner than after brushing with a regular toothbrush. I love a small piece of something chocolate over just about any candy. Hersey Nuggets with almonds would be my favorite. Oh, my goodness, hands down, COFFEE! How would I start my day without it? 10 - Music or Talk Radio? Well, if I'm in the house it would be music and if I'm in my car it is American Family Radio and it is mainly talk radio. 11 - Chick Flick, Action movie or Documentary? I do not care for action or documentary at all. A good chick flick is good every once in a while but a good suspense movie (not scary) is the BEST. 12 - Regular or mechanical pencil? I rarely use a pencil but if I do, I use a mechanical pencil, I have several in my desk drawer. 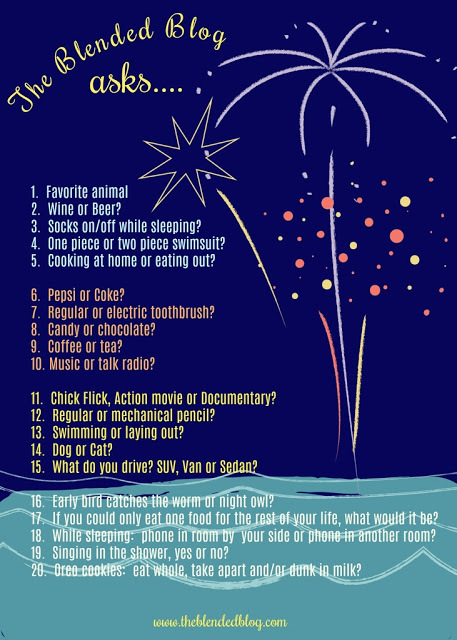 13 - Swimming or laying out? 14 - Dog or cat? If I have to choose, it would be a dog but I really don't want either one. 15 - What do you drive? SUV, Van or Sedan? I drive an SUV. It's been a long time since I've driven a regular car. I love having the hauling space in an SUV. 16 - Early bird catches the worm or night owl? Oh, early bird for sure! I love the early morning hours and feel very productive in the early hours of the day. 17 - If you could only eat one food for the rest of your life, what would it be? How boring that would be but I think I would say chips and salsa but I really hope it never comes to that. My phone is on the charging station and set on Do Not Disturb from 10:00 - 6:00. I do have a house phone on my night stand. 19. Singing the shower, yes or no. 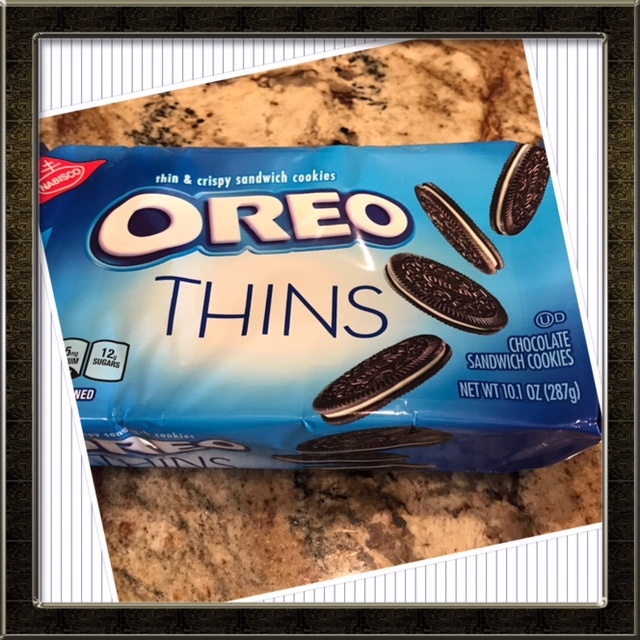 20 - Oreo cookies, eat whole, take apart and/or dunk in milk? So, there it is and now you know just a tad more about me.